Gluten-free renal diet? Think again if you have kidney disease! 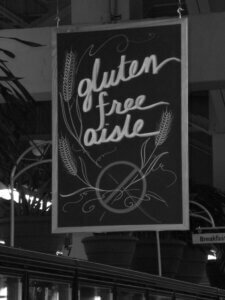 Following a gluten-free diet seems healthy, or at least is definitely in vogue now. With the current trend of gluten-free foods, there is an abundance of alternative grains to grace your cooking escapades. Among the more common of these are brown rice flour, almond flour, and coconut flour. While these alternative grains sound fun and healthy, this is not always the case–especially for a renal patient watching potassium and phosphorus intake. Before we discuss gluten-free products, I want to clear the air. These products are available for those with celiac disease or gluten sensitivity. These conditions result in an inability to process gluten or a strong immunological reaction, so cutting dietary gluten aids in symptom relief. However, a gluten-free diet is not healthier for all people. Going gluten-free has fallen into mainstream health fanaticism, as many try to cure a host of woes–ranging from acne, to weight gain, to infertility. Yet, it is under debate whether going gluten-free will have any effect on these issues. 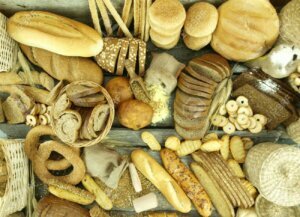 Moreover, when it comes to chronic kidney disease patients, going gluten-free may be harmful for some individuals. This is due to the alternative grains in gluten-free products and their levels of sodium, potassium, and phosphorus—the nutrients controlled on a renal diet. One of the main nutrition goals for kidney patients is to reduce overall consumption of sodium. Current research shows that decreasing sodium intake can actually prevent further kidney damage, which can potentially help avoid dialysis and other treatment. Unfortunately, this is one area where the gluten-free diet and the renal diet do not work to achieve the same goal. After researching alternative grains in my local grocery store, I found that most gluten-free foods are higher in sodium than regular wheat-containing products. As kidney patients know, limiting sodium is already a difficult challenge, so why make it unnecessarily harder if you don’t have to? All of the gluten-free products I picked up contained more sodium than the comparable wheat products. Thus, by switching to gluten-free products without reason, you may unintentionally increase your sodium intake. And as we know, when it comes to sodium, less is better! Furthermore, sodium isn’t the only nutrient we need to worry about in gluten-free products. In addition to higher sodium levels, the ingredients used can also be higher in potassium and phosphorus. For example, ¼ cup of enriched all-purpose flour contains 34 mg of phosphorus and 33 mg of potassium, whereas almond flour contains 131 mg and 204 mg of phosphorus and potassium, respectively. Clearly, almond flour has a significantly higher amount of potassium and phosphorus than regular wheat flour. For people watching their potassium and/or phosphorus, consuming an alternative flour with a high potassium or phosphorus content could be a problem. I used almond flour as an extreme example; however, there are some alternative grains that are more comparable to wheat flour. Every person is different, so switching to an alternative flour in cooking would be an important discussion to have with your renal dietitian. He/She would have the best perspective on your current diet and could give you clear guidance on whether this would be a good idea. If you are someone who needs to follow a gluten-free diet due to another condition, there are ways to do it safely while following renal diet limitations. First off, reading food lab els is always a good place to start. 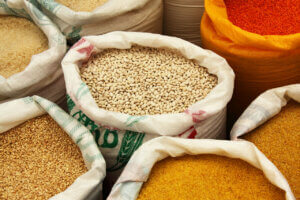 The ingredients list will tell you which alternative grains are used in the product. Further, the nutrition facts will tell you how much sodium and potassium are in the product. If you are diabetic, be especially careful of carbohydrate content, as some gluten-free products are high in added sugars. Also, watch out for products made with large amounts of oat flour, oat bran, and/or almond flour. Sorghum flour is found in many gluten-free products and is a reasonable gluten-free grain for renal nutrition content, so use it moderately. 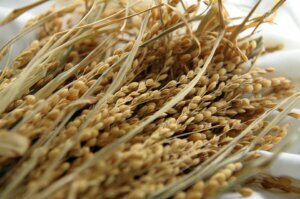 Other, lesser known grains you could try would be millet and white rice flour. Some gluten-free products are good choices for kidney patients, such as Bob’s Red Mill™ Pancake Mix (65 mg potassium, 95 mg Sodium per pancake). Other great products could be unsalted rice crackers (ex. Edward and Sons™ Brown Rice Snaps). A gluten-free kidney diet would have rice and corn as its base carbohydrate with meals, with moderate amounts of whole oats. For example, Rice Crispies or Corn Chex for breakfast with rice milk, corn tortillas (without phos additive) with meat and vegetables for lunch, and rice with fish and your favorite low potassium vegetable for dinner. Ultimately, speaking with a renal dietitian about your specific situation is the best way to know if a gluten-free renal diet is right for you. I must say as a person with gluten allergy, your suggestions are a spot on. We stock on white rice flour as it is not that accessible in my area. Could you please tell me if Tigernut flour is ok on renal diet? Tigernut is actually a tuber and I’m allowed on AIP diet and desperately looking for options. Thank you in advance for your time. Hello! Everybody has different nutrition parameters when it comes to kidney disease. If you don’t have potassium or major phos restrictions at this point it probably is fine. However best to talk with a dietitian or your doctor to make sure you know for sure your restrictions based on your labs, level of kidney function, and current meds. You can find a dietitian in your area by visiting the National Kidney Foundation’s website: https://sites.google.com/view/ckdrd/home.